I spend a lot of time searching the Internet for new and different things to write about and for some reason I keep coming across different ways to memorialize our dearly departed. I’ve told you about drive thru funerals, and diamonds made from ashes, and talking headstones, so I figure what the heck… In keeping with tradition I might as well let you in on this too. An Arlington Vermont company called Cremation Solutions is creating custom made cremation urns in the shape of your loved ones head. 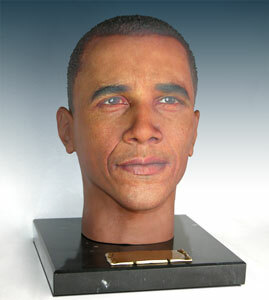 Thats right, with just one or two pictures of the persons face, and by using state of the art 3D imaging techniques, the company will make a polymer compound likeness of your loved one’s head and mount it on a marble base. Excellent. I know you’re probably wondering, so yes, the heads will have hair, for folks that had very closely cropped hair, it can simply be digitally added to the head, or the company will gladly add a wig, per your specifications. Ashes are loaded from the bottom and a beautiful brass nameplate is affixed to the heads luxurious black marble base. Yes, we at US FUNERALS ONLINE have also been watching the explosion in the personalization of death, and particularly in relation to what new and interesting ways people are finding of immortalizing their cremated remains. I think a cremation urn the shape of a head is a little spooky, but each to their own. Another new niche to add to this article is “AndVinyly”, a UK-based company who will create vinyl records with your cremated remains! How about that? We are also seeing an increase in interest in blasting remains into space, and interring in memorial reefs. I certainly believe that with the rising cremation rate, we are going to see many more new niche businesses spring from the whole ash scattering and memorialization aspect of death care.